Spring Break 1936? Texas Tourism Before The Interstate Highway System. In honor of all those Spring Breakers out there, traversing Texas Highways with their family or college friends on epic road trips, and also in honor of our special exhibition Mapping Texas: From Frontier To Lone Star State, we’ve decided to feature an article about a map that some of our grandparents ( or even great-grandparents) may have used for trips not unlike the ones some of us our taking now. Well… They were a little different, considering the Interstate Highway system didn’t exist yet. R.M. Stene, Official Map of the Highway System of Texas, Austin, TX, State Highway Commission, 1 March 1936, Map #83598, Map Collection, Archives and Records Program, Texas General Land Office, Austin, TX. Issued in 1936 by the State Highway Commission, rather than a commercial entity, this map was for “free distribution” only. It highlights the extensive network of highways that traversed Texas twenty years before the federal Interstate system we know today. 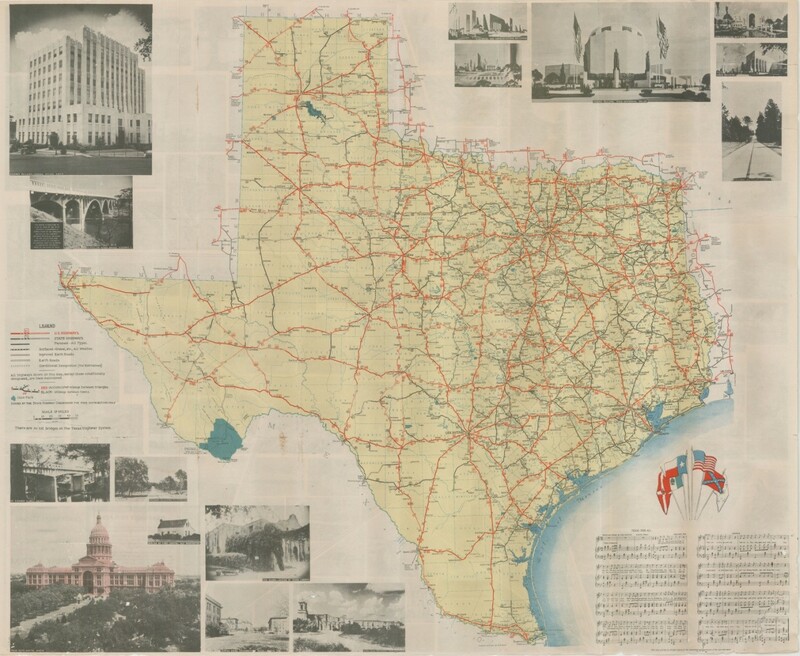 Produced primarily as a tourist map for Texans and visitors and to commemorate the 100th anniversary of Texas independence from Mexico, the map features every major population center in the early 1930s and provides mileage figures between cities and towns to aid with travel planning. A special reference is made to the enticing fact that “There are no toll bridges on the Texas Highway System.” The Commission showcased photographs of some of the most visited and famous Texas landmarks in the margins to entice tourists. The period photos of the State Capitol, the University of Texas in Austin, the Alamo and Mission San José in San Antonio are placed alongside scenic two-lane highway views. The sheet music and lyrics for the song “Texas Above All” found underneath six flags of Texas in the bottom right corner is an original song written by Gibb Gilchrist. An experienced engineer, Gilchrist served two stints as state highway engineer and directed the building of a system of roadside rest stops. He became president of Texas A&M University in 1937 and later chancellor of the Texas A&M College System. A reproduction of this map can be purchased on the GLO website. In 1936, Houston, San Antonio, and Austin were connected by a series of highways prior to the construction of the Interstate Highway System twenty years later. Small red numbers, such as the “78” between San Antonio and Austin, indicate the distance between two red triangular points on the highway, while small black numbers, such as the “18” between New Braunfels and San Marcos, indicate the distance between towns. 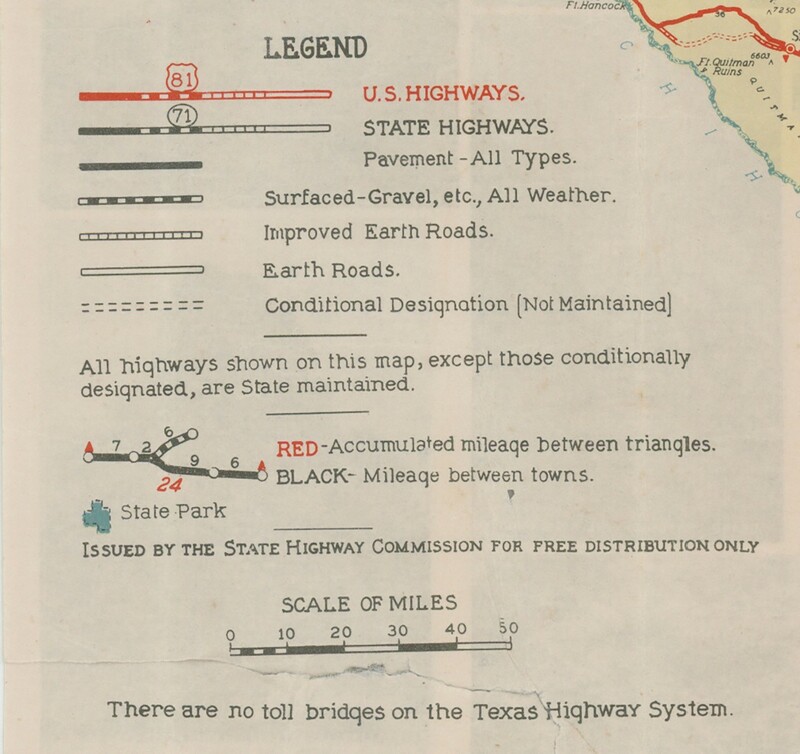 The legend describes the various types of highways and markings on the map, while also making a point to travelers regarding the Texas Highway System’s lack of toll bridges. This map was issued for free by the State Highway Commission. 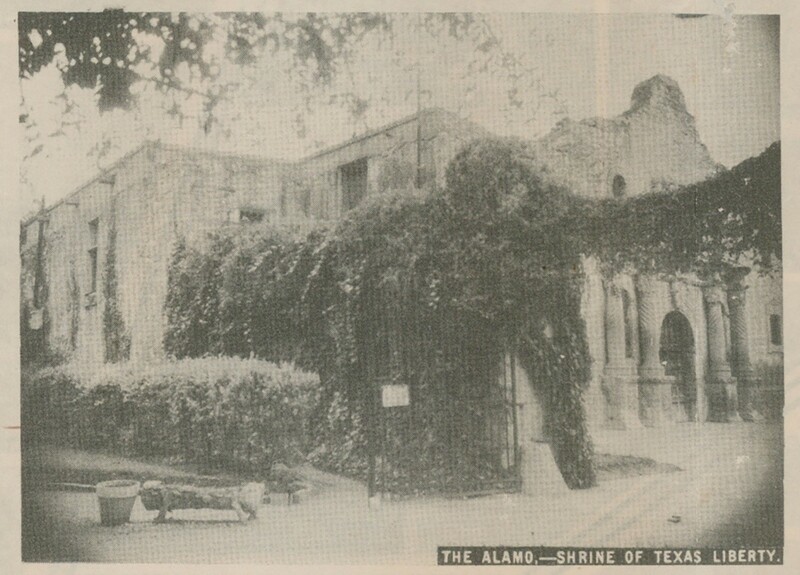 A photograph of the Alamo is one of several images found in the margins of the highway map, which was intended both to decorate the map and entice tourists to visit. 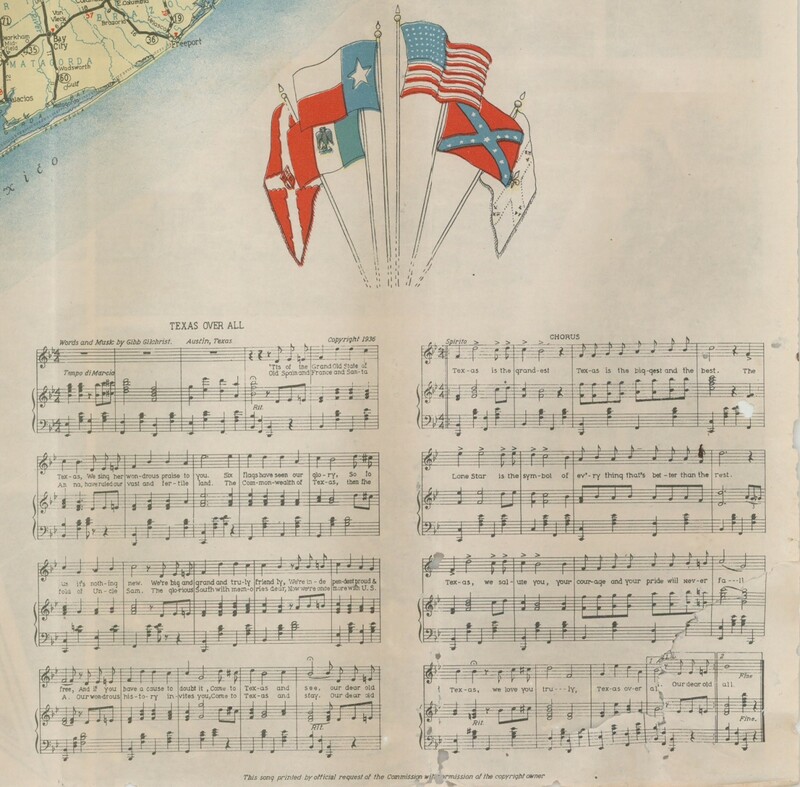 The six flags of Texas preside over the sheet lyrics and music to the song “Texas Over All,” written by Gibb Gilchrist, a former state highway engineer who became president of Texas A&M University in 1937, the year after this map was published.